*Thanks to DD of Whisky Party for the sample! Nearly 14 years ago, on a memorable trip to Ireland, my family and I were introduced to Redbreast by a heroic concierge at the Mercer Hotel in Dublin. We had been drinking Bushmill’s Black Bush, which, to be fair, was met with tacit approval, but our guide pushed us further. Redbreast, he said, and if you see it, Green Spot. We saw a lot of Redbreast. We liked Redbreast a lot. We drank a lot of Redbreast. Perhaps we opted for Redbreast over Green Spot because of some puerile preference for a red breast rather than a green spot, which to be honest, doesn’t sound all that healthy or at least doesn’t sound like something that would come out without a lot of scrubbing. In any case, Redbreast was abundant, Green Spot was not. I saw it in shop windows on occasion, its wonderful label and concierge-approved reputation beckoning, but I yielded not to its siren call. I would regret that siren-call-yielding for many years hence. Getting a bottle to the states was tricky and expensive and getting myself back to Ireland was even trickier and more expensive. 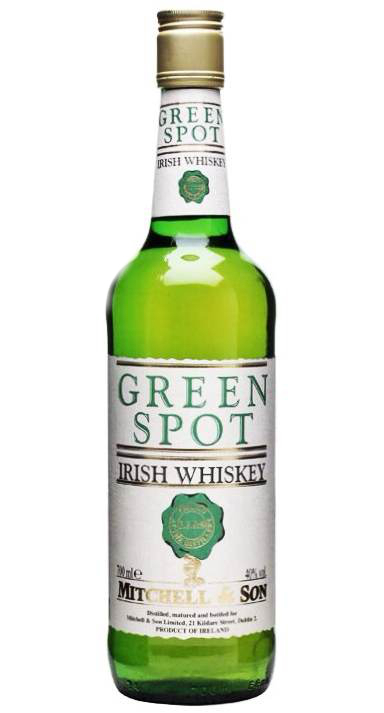 Luckily, thanks to a fellow blogger, I was eventually able to sip some of this fabled pure pot still gold, and now, many years after that first mythic sighting, Green Spot is joining the Irish whiskey boom and finally hitting shelves near me in the U.S. So what, exactly, is it about Green Spot that gives it this legendary status? To begin with, its history. In 1805, a family by the name of Mitchell went into the grocery business in Dublin. 82 years later, the successful business expanded into wine and spirits, specifically whiskey, which was a booming business at the time. Mitchell & Son became whisky bonders, they had their own casks filled with spirit from Jameson’s Bow Street Distillery, and sold it under the Green Spot brand. This was common practice at the time, but Mitchell & Son were particularly successful at it, reportedly ordering 100 sherry casks a year even during the downturn of the early 1900’s. The name “Green Spot” apparently has a couple possible origins. Originally the whisky was called “Pat Whiskey” and featured a rough-looking chap on a green background on the label. Somehow this morphed into “Green Spot”. If that story sounds as shaky to you as it does to me, try this more plausible one on: Mitchell & Son were so successful with their whiskey bonding that they expanded their range over the years to include a Blue Spot (7 years old), a Yellow Spot (12 years old), and a Red Spot (15 years old) to go along with the 10 year old Green Spot – the casks destined for each style marked with the appropriate spot of paint. Green Spot proved to be the most popular of Mitchell & Son’s whiskies, indeed as whiskey’s popularity in general waned and the trade of whisky bonding died out, it remained the only brand of its kind after the 60’s. Since then, up until a year or so ago, Green Spot held its place as a rarely seen Irish gem. When Redbreast was finally brought to the U.S. in the mid-2000’s, it raised from relative obscurity the distinctly Irish process of “Pure Pot Still” style whiskey. Pure pot still, or as it is legally called today for no good reason whatsoever, “Single Pot Still” uses a combination of malted barley and un-malted barley in the mash in contrast to single malt Scotch which uses 100% malted barley. Redbreast became a well-known and well-renowned ambassador for the style, with the only other Pure Pot Still brand being…the hard to get, mythic Green Spot. The Nose: Initially quite sweet and simple, but an underlying complexity causes a double-take. There’s a lot of honey and fruit here; juicy, tart apples, tangerines, and sticky figs. A bit of the sweetness comes from the grain notes as well – brown sugar and butter on oatmeal. That crisp Irish pot still character seems almost a little mentholated here, with subtle, hovering notes of peppermint candies. Behind the sweetness are spice notes of sanded oak, soft clove, candied ginger, and vanilla syrup. The Palate: Wonderfully coating and oily mouthfeel with a malty grain-forward sweetness along with continued juicy citrus sweetness from the nose. Notes of nutty toffee and dark chocolate lead to a near-perfect swell of spice. There’s more of that pleasant, unique peppermint towards the end, along with clove, vanilla bean, and hints of charred oak. The Finish: Longish with vanilla, a touch of mint, more soft clove, with a bit of oak and salted nuttiness fading in the end. Thoughts: A gorgeous Irish whiskey. Sweeter than Redbreast, less bold and spicy as well, or at least spicy in a different way with those delicious, unique, well-integrated peppermint notes. At first, it seems a touch simple, but there’s a subtle yet deep complexity to the nose, and on the palate, a strength belying its lowly 40% ABV. The sherry cask influence is faint, showing up in the fig-y notes on the nose and the added nuttiness on the palate. Overall, Green Spot is just an absolute pleasure to sip, balanced, well-integrated with such a well-made progression through its flavor range. A beautiful example of the distinctive Irish Pure Pot Still style. So far, the new version is well-regarded as well, hopefully I’ll be able to do a head to head soon. This older version, with a doubt, is very difficult to find now, but if you get the chance, leap at it. Highly, highly recommended.